Sometimes you only need one of the above, and sometimes you need all three. Yesterday was a day I needed all three. I didn’t see my breakdown coming. Usually I do. Usually I’m at the end of my rope, exhausted and it’s been building for days. I was not prepared for today. I’ve really reached a point where I comfortable with who I am and who Molly is. There are definitely days that are harder for others, but I understand her, I’m ok with just her being her. There is however, the “A” word that hangs over us. Austism. There are times when I don’t need a diagnosis, why would it matter? We have the therapies we need, we have support, but we don’t have closure. It’s hard to gain acceptance for something you don’t have. Earlier this week I spoke with a mother of a child with autism and had a rude awakening. She asked very specific behavior questions all which I answered “yes” to. Never once did she hint that Molly was autistic, but I knew these were the same challenges she faced with her child. That was a hard day. No diagnosis also means I can stick my head in the sand and ignore what is often staring me in the face. I was up half the night with the kids. First half of the night with Molly, second with Charlie. I’ll admit it, I was tired. I wasn’t prepared for our playdate. In fact, I was underprepared. We were going to a familiar house, with familiar friends, what could go wrong?? We just went a birthday party and Molly didn’t even notice if I was there, she played happily with her school friends. And that is where I failed and that is why her quirkiness left us sitting in a chair crying. We may have gone to a familiar house but not everyone was familiar and Molly, well, she just couldn’t find her place. It was loud, there was a lot going on, she wasn’t quite old enough for the girls and was too much of a girl for the boys and she felt alone. Her inability to survive in the chaos echoed loud and clear into my heart and I wanted to help her, I wanted her to have fun, I didn’t want to be in the same place we always are and I didn’t know what to do. I didn’t bring headphones, I didn’t have a suggestion that was suitable and I couldn’t go bossing around kids to play with her. I hate being in this situation. And while I was trying to hold myself together and figure out what to do next, I had help. I didn’t ask for it, but I got a hug and it was all I needed to break down and start crying. Then I got another pair of arms to hold the crying four year old girl and then I started crying more because it was nice to have help. And it felt great to just be loved. Then I remembered there was a mom there I had only known for twenty minutes. And then another new mom came through the door. And then I felt slightly silly. They don’t know our struggles, they didn’t realize we had come so far and I was frustrated to be back at the starting point again, but we are all moms and we all struggle so I felt blessed that neither blinked an eye or skipped a beat. We poured ourselves some wine, started munching on some yummy food and I pulled myself together through great conversation. Most of my mom friends can agree that we don’t like change. And by “we” I really mean “our kids”. 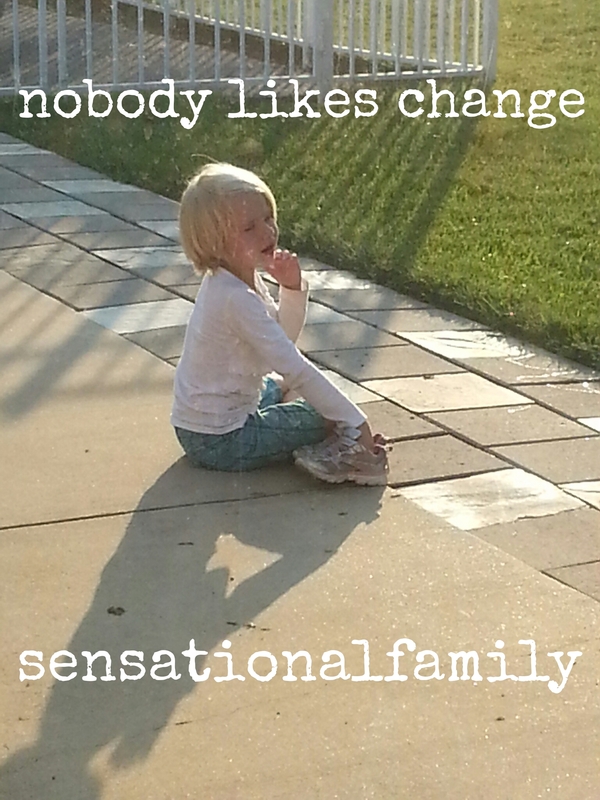 I live in a house with one child that could care less about changes. School? Whatever. Daylight savings? Bring it on. Christmas break? No problem. Then there is the other one. I recently wrote about a rough week where I had been bitten, punched, scratched, and more. But that post was only the tip of the iceberg. It was a 2 box month. Boxes of wine, that is. Naturally, the first thing I ask when things go wrong day after day is “what has changed?”. The problem was everything changed. We stopped going to OT, we were discharged from behavioral therapy, it was Christmas, school was canceled, the list of changes never ended. Naturally we waited for school to start up again and our daily routine to kick in, but that didn’t help. We bought a sensory swing, that only somewhat helped. It left me scratching my head. What changed? Then it hit me. Nothing changed for Molly, things changed for Charlie. Our little Charlie had a monumentous change that actually affected all of us. He stopped napping. Surprisingly Stampy and I loved that change. I never thought I would love the day we lost nap time but I do. I love not being bound down by the clock. No worrying about scheduling things around naptime anymore. We are free! That freedom though took away something special for Molly, her one on one time with us. Everyday when Charlie napped Molly got distraction free attention from us. We read, we played games, we did crafts, she watched TV while I played on Facebook and Pinterest, but it was quiet and down time. She lost that. She lost that special time, she lost that time to herself. Now her whole day revolves around sharing everything from toys to attention. She didn’t like it. I can’t blame her. I miss my “alone” time too. We’ve had a tough week. That might even be an understatement. In the past week I have been bitten multiple times, scratched, punched, kicked and had my hair pulled out. I wasn’t kidding. It was tough. Oddly, I don’t feel that these are the times that test me as a parent. It’s easy to be patient and empathetic when your child is suffering. When she is so far gone that rational thinking is in another universe there isn’t much you can do but be patient. Also, two irrationally angry people rarely make good decisions. So I show her empathy hoping that she learns how to react when you are upset. I show that I love her at her worse. I show her forgiveness. Then I get the little girl that sat next to me at church this morning. Out of her element, unsure of her surroundings, scared, but holding my hand and snuggling into my leg. She didn’t let go the entire time. Although she rarely verbalizes her love, she embraces me when she’s scared and lets me know that she feels secure with me. That’s when I know that I’ve made good decisions. It’s these moments that will give me the patience the next time things get tough. I remember being a kid and waiting not so patiently for Christmas morning. I remember my brother and I trying so hard to stay awake to hear Santa and waking up at 4 am and waiting until our parents would allow us to go downstairs. I couldn’t wait for the presents, to see what exciting things Santa left. Christmas morning was awesome. Naturally when I had kids I couldn’t wait to relive that moment. I was excited to see the reaction of all their new gifts and toys under the tree. This video is a pretty good representation of every Christmas morning, except the fact that no one is crying this year and it didn’t take 20 minutes of coaxing to get the kids even near their gifts. In fact the kids actually opened their gifts this year, so it is a step in the right direction. I have high hopes for Charlie next year that he will actually be excited on Christmas morning. I only assume Molly will be questioning the existence of Santa by then. This year she already wants to know why Santa built her a chalkboard last year on the wall and this year brought her one on an easel. Santa needs to get his stuff together. On the bright side, we don’t have kids waking us up at 4:30 AM to collect their bounty.